Making its debut April 2018, type:A deodorant has disrupted the world of clean deodorant. 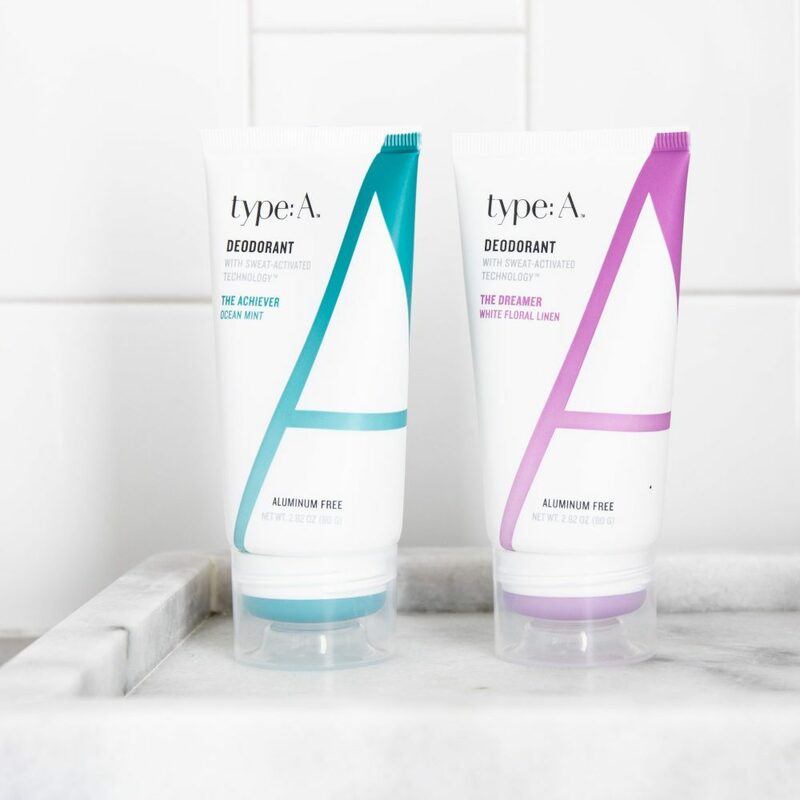 Type:A has taken an innovative approach to clean deodorant through its non-toxic combination of natural and synthetic ingredients and unique packaging, making it as effective as it is safe. Allison Moss, founder and creator of type:A, used her years of marketing experience in the indie beauty industry to create a brand that has been well received by beauty partners such as goop, Credo Beauty and Follain as well as clean deodorant enthusiasts. CEOMOM chatted with Moss to learn more about the inspiration behind this innovative brand and what’s next for type:A. Tell us about type:A deodorant. What makes this deodorant unique? type:A is unique in a couple of ways. We are a high performance deodorant that is focused on being non-toxic and 100% clean and safe. We embrace natural ingredients as well as safe synthetic ingriends, which allows us flexibility to deliver a smarter and harder working deodorant. The output of that is our sweat-activated technology. We were able to develop a formula that is activated by moisture. Little by little it is delivering and releasing protection throughout the day so you get longer lasting protection. type:A comes in a tube but you swipe it on just like you would a stick. We wanted the user experience to mimic what people like about a stick so we built an innovative package around the formula that mimics the same “swipe and go”. What is your background? What inspired you to create type:A? In a way, I see type:A as an extension of my career in marketing in the beauty industry. I worked in New York managing brands and bringing new products to market. I have been working with smaller and more indie brands over the past five years. I was personally trying to find a natural deodorant that I could stick with, and when I couldn’t find anything that wasn’t a trade-off, I decided to do it myself. What are your plans regarding product development? Will you be creating products other than deodorant? We are a one product company at the moment which is very intentional. We wanted to do this one thing very well. We want to make sure we are delivering a great product and getting it to as many people as possible. That said, we are working on some really great ideas. You debuted type:A deodorant in April 2018. What has your first year of business been like? It has been exhilarating. We really hit the ground running and when we came to market, the reception to type:A exceeded all of our expectations. People were really excited to find something that worked for them. We are focused on doing right by our customers, and growing the business in ways that will be meaningful to them. You recently partnered with Follain beauty brand. What has that meant for your business? Working with Follain Beauty has been great. The team over there is wonderful. They are picky about the brands they bring in so to be a part of their assortment has meant a lot. They felt our product aligned with their business. We launched with them during the holidays which is a crazy time to launch. It’s still really early but it has been a very positive relationship so far. What are your plans to partner with major retailers like Whole Foods? We would love to extend our reach. Whole Foods would be a great example of a partner. We brought on small strategic retailers last year and it has been fantastic. Right now, we need to focus on continuing to make the best product. Type:A is years in the making. What has been your key to managing family life with starting a beauty company? I couldn’t be happier doing what I’m doing. I love being a mom. I have two of the most amazing children in the world. Being a mother is rewarding but I am also a person with passion and ambition. It is so rewarding to build this business in a different way. I hyperfocus my attention on my business and my family. I love being able to model for my kids setting goals, dedication and hard work which come with building a business. When I’m with my kids, I try to focus on just them. When I am at work, I am at work. It is not cut and dry and it’s not nine to five. In the middle of the day I may switch gears. I think when I can be committed and stay focused on what I am doing, I can accomplish anything. Learn more about Allison Moss and type:A deodorant at https://typeadeodorant.com/.